FILE - Professor Wendy Harwood poses for a photograph in a plant breeding incubator room with barley plants that have undergone gene editing at the John Innes Center in Norwich, Britain, May 25, 2016. Much as they did at the onset of the Atomic Age, scientists are now grappling with the ethics of a technological advancement — in this case, our ability to manipulate the genetic code. And they warn that civilization is rapidly approaching the point where it will have to decide what to do with its newly acquired power to change the genetic structure of living things. The newest conversation has to do with an enhanced inheritance system known as the “gene drive,” a self-replicating bit of genetic code that scientists could use to pass on created genetic traits to the offspring of a living thing in the wild. We modify the genetics of things we control all the time, Mendel's plants for example, and we cross-breed domesticated animals and agricultural products to make them more productive, or adaptive to harsh climates. But inserting a modified bit of DNA into a gene drive makes it possible to pass along genetic traits to plants and animals in the wild, even traits that reduce their fitness for survival. Conceivably, scientists could use a gene drive to wipe out the Aedes aegypti mosquitoes that carry the Zika virus, or invasive species that are destroying native plants and animals. 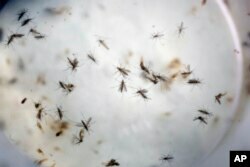 FILE - Aedes aegypti mosquitoes are seen in a mosquito cage at a laboratory in Cucuta, Colombia,Feb. 11, 2016. In a report published Wednesday, the U.S. National Academies of Sciences, Engineering and Medicine endorsed research on the technology but also warned that nobody knows whether the release of altered organisms into the wild would cause some unwanted consequences. The NAS committee, made up of 16 biologists, ethicists and policy makers, says that in spite of clear potential benefits of the new technology, there is not enough evidence to support any release of modified organisms into the environment. For understandable reasons, many people would support disabling organisms such as mosquitoes and some rodents from carrying the diseases. But scientists say before doing that we need to fully understand the scientific, ethical, regulatory and social consequences of such a move. Scientists say, unlike pesticides or genetically modified organisms, the “gene drive” is spread through sexual reproduction and will keep spreading as long as the target organism keeps reproducing. It cannot be localized within a farm or within a country’s borders. In addition, if a modified organism mates with another species, the gene drive could spread to the non-target species, perhaps driving it into extinction.